Description All your Brochure Display Units will be sent as individual units by parcel delivery. Your Brochure Display Units will be sent in two separate deliveries – one by pallet, one by parcel. Designed to hold between 8 and 32 A4 brochures. Silver anodised aluminium frames (50 × 25mm) with acrylic brochure shelves. 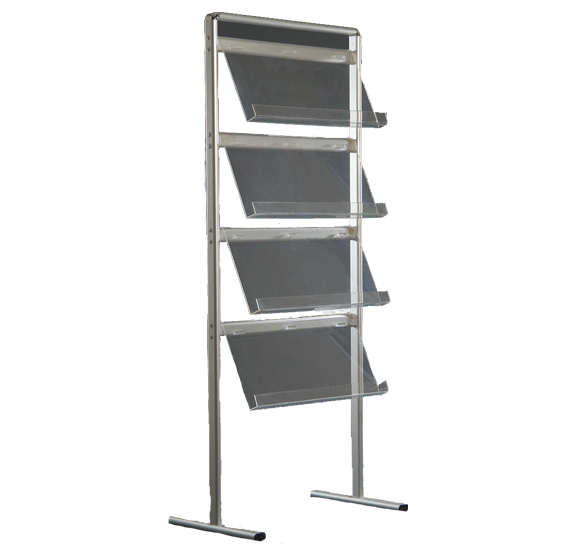 Single and double-sided freestanding units available with optional wheels. Single sided wall mounted unit available from stock. Shelf internal capacity: 40mm (d).